Station and level crossing at Great Bentley. 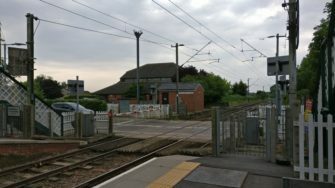 Station platform and level crossing at Great Bentley. I had an interview in Jaywick so thought I would make some more recordings of Essex sounds on the way back. 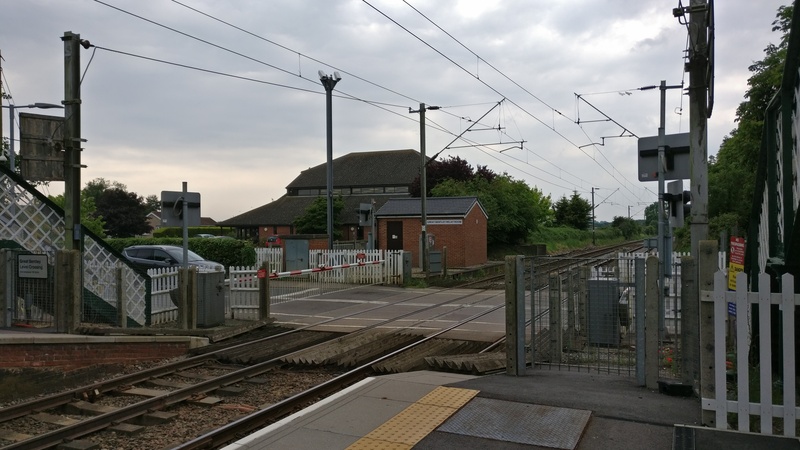 As I often do I took the scenic route in order to discover some new places that I was unfamiliar with and happened across Great Bentley which has a level crossing, something which I was aware that I hadn’t recorded yet for the project. So I parked up and tried to find someone in the station to ask permission to record (as per the advice to photographers) but there was no member of staff in attendance. The departures board said that there were two trains due shortly so I quickly set up at the level crossing end of the platform to get a mixture of trains, crossing and town noises. Firstly a Class 360 going to Clacton pulled in to the station and then away, before a Class 321 heading to Colchester Town pulled in to the opposite platform. After that too had pulled away you can hear some children running over the foot bridge and a very loud blackbird throughout.